Day 1. pick up from bagdogra airport and driven to Sikkims capital Gangtok, you will pass through dense jungle forests, tea plantations, rivers, streams and many small villages as you drive through West Bengal into Sikkim. Arrive in Gangtok, evening free for sightseeing, overnight stay in a hotel on a b&b basis. Day 2. after breakfast, you will be picked up and taken to Yuksam, again you will pass through many small villages, tropical forests and pass by rivers and streams, this journey has many beautiful sights for you to see, arrive in Yuksam, evening free for sightseeing. Yuksam is situated at an altitude of 1780m and was the first capital of Sikkim,where according to the historical records,the first king of Sikkim was consecrated here in 1642 A.D. The first and oldest Dubdi monastery was built on a hill top above Yuksam., overnight stay in hotel/homestay on a b&b basis. Day3. after breakfast we will pass through Yuksam on our way to our first overnight stay which is Tsokha(3000m), you will pass through tropical jungles, crossing over raging rivers and waterfalls, see white monkeys. soon you will be seeing your first rhododendrons such as Rh arboreum, rh falconeri and rh barbatum plus many other flora and fauna, before you reach Tsokha you will pass through Bakhim (2700m) Bakhim is a small settlement where There is a two storied wooden hut specially established for the Forest department and also used by the HMI (Himalayan Mountaineering Institute). One can get a wonderful views of the beautiful valleys looking towards Yuksam, Pelling and Darjeeling. Arrive at Tsokha, overnight stay in trekkers hut/tents. Day 4. after breakfast, we make our way through Tsokha village.The village is a small and has a single settlement with only 7 households., the residents here are Tibetans who fled from to Sikkim during the 1959 chinese invasion of their country Todays trek is a tough one walking for approx 7 hours. in the morning we will be heading towards Phedang passing through rhododendron forests, the main rhododendrons here are rh barbatum, rh falconeri and rh arboreum, there are also abies spectablis and many Daphne bhuloa, in spring the forests are carpetted with many primula species, the further you go up you will also start to see rh thomsonii and sorbus and Acer species, once you have reached Phedang you will rest and have lunch, from here you can see beautiful views of Mt.Pandim, Mt.Thenchinkhang, Mt.Jhopuno. Phedang is surrounded by a large forest of rh thomsonii with its lovely bell-shaped red blooms, after lunch the first hour is a hard trek up, after that it is mostly downhill passing through endless forests of rhododendron fulgens with its brown peeling bark and red blooms, as you get further towards Dzongri(3950) Dzongri has only single Trekkers hut and two forest huts. From the ridge above the site you can get panaromic views of Mt.Khanchendzonga, Mt.Kabru and mt pandim. you will see many alpine plants like Juniperus recurva, rhododendrons anthopogon and setosum. Rathon, Mt.Koktan, Mt.Pandim, Mt.Jhoponu, Mt.Thenchinkhang and Mt.Narsing. overnight stay in trekkers hut/tents. Day 5. today is a rest day to help acclimatize. 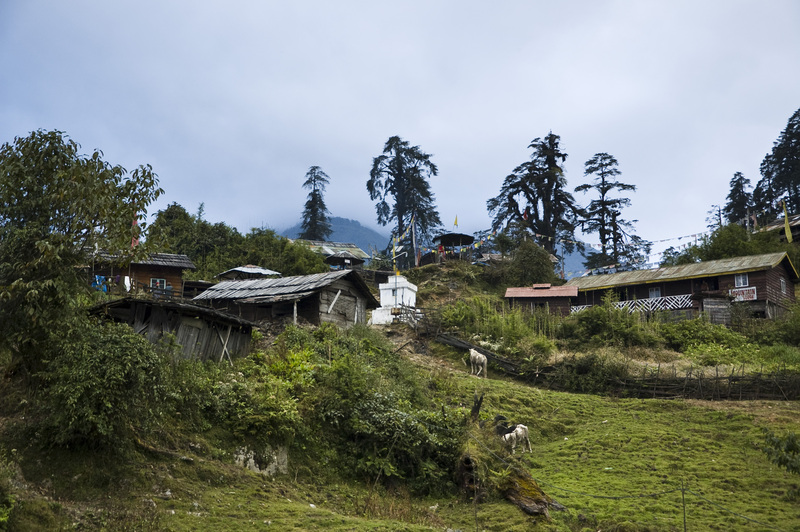 After breakfast you are free to rest or explore this lovely region of Sikkim. Day 6: After breakfast we will return to Toskha, overnight stay in Trekkers hut/tents. Day 7: After breakfast we will make our way back to Yaksum, afternoon free to explore the former capital of Sikkim, overnight stay in hotel on a b&b basis. Day 8: After breakfast, you will be taken to darjelling driving past huge hillside tea plantations, tropical forests and many small villages, the drive has stunning mountain and valley scenery, arrive in darjelling evening free to explore, overnight stay in hotel on a b&b basis. Day 9: early morning pick-up to be taken to see the sun rise from tiger hill, this is a scared moment when you will see the Mount Khangchendzonga light up with the new rays of the morning sun, after this we will take you to visit the famous Ghoom monastery, taken back to hotel for breakfast, after breakfast you will spend the day sightseeing, visiting the Gurkha memorial, darjelling toy railway, Darjelling zoo, the peace pagoda and many many more sights, evening free to explore, overnight stay in hotel on a b&b basis. Day 10: after breakfast you will be picked up and taken to Bagdogra airport, service ends.